The average pillow takes a one-size-fits-all approach to comfort. But most of us have pretty specific support and comfort needs based on our build, sleep position and preferences. One size can’t possibly fit all. The common pillow just doesn’t get the job done. Do you have to bunch or fold your pillow to get the firmness or height you need? Do you fight shoulder pressure when you sleep on your side because your pillow doesn’t provide enough lift? Are you stacking pillows to help reduce nasal congestion, reflux, or snoring? Are pillows routinely too flat or too big to give you the support you need? Common pillows are often not the right height. 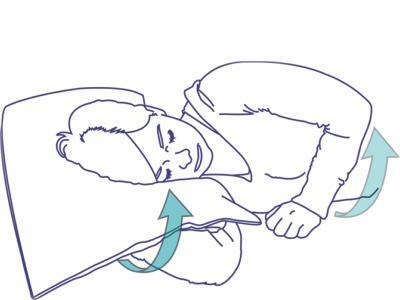 Tucking an arm under a pillow to help bolster your head can be a common—and sometimes uncomfortable—way to compensate for a too-flat pillow. Common pillows often lack the edge support needed for stable side sleeping. The result is forward rotation, which collapses the posture of the head, neck and chest and increases pressure on the shoulder and hip. The O2 Pillow delivers the appropriate height and firmness. The design provides extra support at the edge to stabilize your posture. The result is comfort and elevation that lasts throughout the night. The O2 Pillow is designed to tackle common pillow problems by offering personalized fit and reliable support. It’s available in a range of sizes—you get the height and firmness that’s right for you. Its unique tri-layer construction provides stable positioning and elevation. Made from eco-certified latex foam and luxurious knit cotton, it’s durable and feels great. Side sleeping is the most common sleep posture — it’s comfortable and helps some people reduce snoring and breath easier. But most pillows are too low or soft. 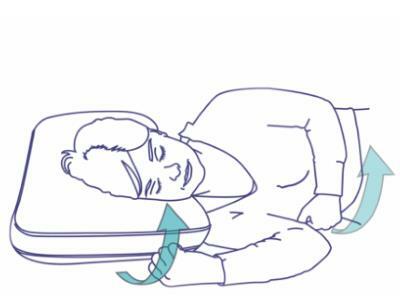 Side sleepers often have to stack, bunch or fold pillows to get the support they need. Unfortunately, these kinds of strategies fail to provide reliable elevation as you shift positions throughout the night. The result: a pillow you have to “manage” to get the support you need. The Oxygen Pillow eliminates the need to manage a pillow by giving you personalized fit and contour. It matches the correct height and density to the elevation you need for comfortable side sleeping. 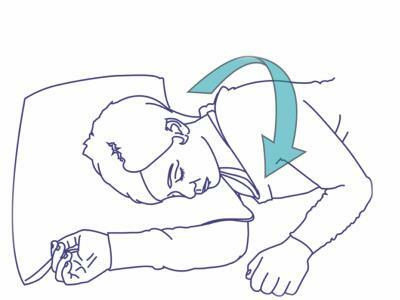 Sleeping on an incline with your head and chest elevated may help mitigate symptoms of nighttime snoring and acid reflux—but sleeping comfortably in this position can be a challenge. Our O2 Wedge was to designed to make sleeping “propped up” easy and comfortable for both side and back sleeping. Made from soft knit cotton and pliable latex foam, our wedge accommodates the shoulder for comfortable side sleeping while providing gentle support for back sleeping. The wedge sits on top of your mattress and can be easily moved for your convenience. Research has shown that side sleeping and adequate elevation of the head and neck may help reduce snoring and sleep apnea, both of which can impact health. While the O2 Pillow and O2 Wedge are designed to provide increased elevation for easier breathing, they are not intended as a substitute for corrective devices, procedures, or the advice of a physician. Take this short questionnaire to find out what size your pillow should be. 1. How tall are you generally? 2. What is your build? 3. What is your preferred sleep position? 4. What is your gender? 5. Do you have issues sleeping?